These are galician bridges that hold great beauty and a history you will feel upon setting your feet on their stones. 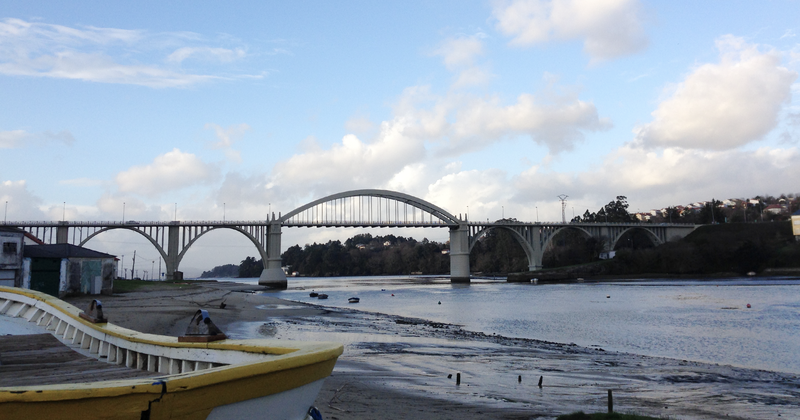 This is a small selection of five Galician bridges that, if you do not know yet, you should visit. Above all this bridge has the advantage of a really evocative name, which refers to the Galician-Roman past and that served as inspiration to the poet Eduardo Pondal: this was the name of one of the heroes who, in his creations, fought against the invader. The bridge crosses the Xallas just before the tail end of the dam of A Fervenza, one of the many that takes advantage of this river in A Coruña. This bridge was originally crossed by the Santiago Way to Fisterra. It is a work of very probable Roman origin. According to the archaeological works, during the Empire in there was a crossroad in this area and, therefore, at least one village that would serve the travellers. However, the current bridge is from the Modern Age, towards the sixteenth century, and consists of four stone arches, the biggest of which is more than eight meters high. It is one of the most renowned and portrayed places of the Santiago Way to Fisterra and Muxía, and with good reason: Ponte Maceira, which hangs over the Tambre between the municipalities of Ames and Negreira, was built in the twelfth century and its seven arches (all of them rounded except for the middle one which is pointed) were witnesses to medieval battles. It is also surprising for the beauty of its surroundings, consisting of a small village built around the hermitage of San Brais and, above all this, the dam and the mills that once took advantage of the strength of the water at this point of the river. Unique for the height of its main arch, about twenty meters above the Bibei River, this bridge is a true prodigy of longevity. It was built in the second century by Roman Empire engineers and, with minimal reforms, still holds the traffic of the local road OU-636, which links Larouco and A Póboa de Trives. 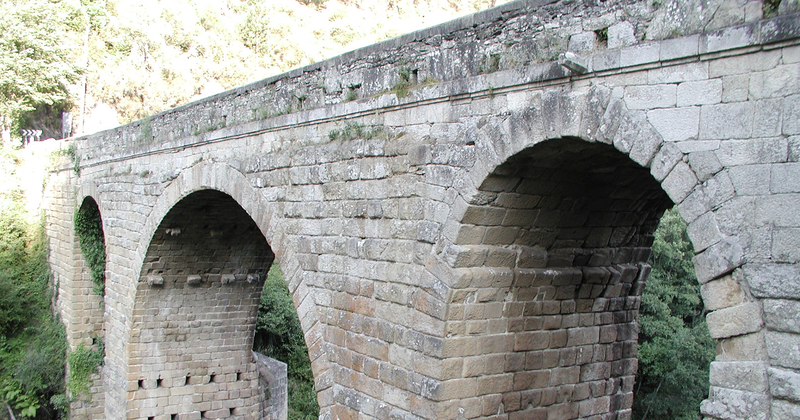 It is, in fact, one of the few Galician bridges that conserve most of its Roman construction; proud of that past, in one of its extremes some milestones have been laid, a testimony of the importance that it held as a means of communication two millennia ago and that it still conserves to this day. 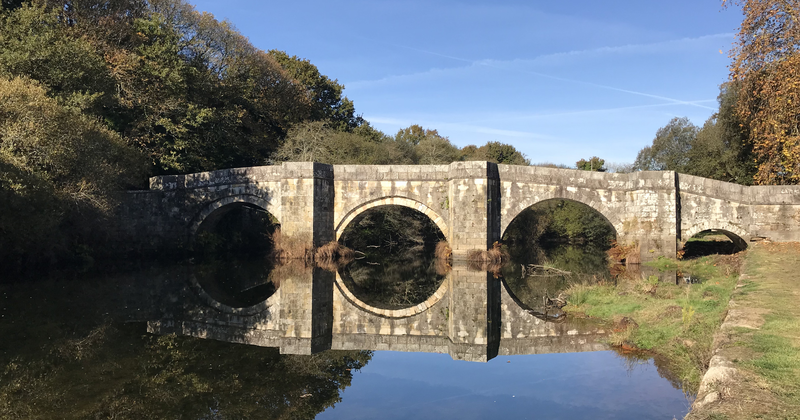 With its six pointed arches, of Gothic inspiration, Pontevea Bridge crosses the wide Ulla river between the councils of Teo and A Estrada, halfway between the provinces of A Coruña and Pontevedra. It was built in the fifteenth century and has an unmistakable triangular silhouette. Right in the middle, a stone indicator shows the point that separates the provinces of A Coruña and Pontevedra. From the bridge and downstream, a short stroll away, you can reach the Burga de Xermeade, a spring of medicinal waters that once held a small bath. It is not wrong to finish a list of Roman and medieval bridges with a much later, almost contemporary, construction. The Pedrido Bridge was built between 1939 and 1942, amid the postwar, to cross the Betanzos estuary between the municipalities of Paderne and Bergondo. It is a work in concrete by the engineers Eduardo Torroja Miret and César Villaba Grande, unmistakable for its light profile, its central elevated arch and the white tone of its cover. It was built at a time when the only means of crossing the estuary was by boat, so the trip between the cities of Ferrol and A Coruña was shortened considerably. In fact, until the opening two decades ago of the extension of the AP-9 highway between these two cities, it was an essential part of the main communication route of the Artabra coast.